In his latest blog post, An Alternative to ‘Water Visibility’, Mike Cline provides an excellent review of many (possibly most) variables fisherman face on the river. It is clear he is a seasoned angler with much experience leading to the insights he shared. Thanks for that work! Before going on, Mike suggests that generalizing from one stream “can’t really be compared or evaluated.” I disagree with the statement in part. That is like suggesting every time I get to a new river, I can’t apply my learnings from the rivers I have fished previously. Generalizations can be helpful. In fact, Mike’s excellent response has several generalizations. And that is appropriate. Why? Because generalizations are the beginning of learning. Generalizations come from being observant, they help us formulate patterns. We can try applying the patterns to new situations to see if it translates. Sometimes the patterns don’t translate completely. But frequently they translate at least in part, and in the best situations, they translate almost fully. This allows fisherman to go to new bodies of water (rivers and lakes) and have more success faster. I would surmise that Mike has lots of success as he has formulated his own generalizations he shared in his recent blog. These help him be more successful. I need to come clean here. I am trained as a scientist. Part of my training is to look at complex situations, identify the variables, set a hypothesis, and test the hypothesis. That is called the “scientific method.” When one tests the hypothesis, the goal is to minimize or completely remove (or control) the influence of the other variables so you can see how one or two variables change the outcome. If all of the other variables are controlled, then any changes in the outcome can be attributed to the test variables. By applying this methodology to stream trout fishing, it helped me identify “water visibility” as a key factor in identifying where to catch more and larger trout. In this blog we will examine how Mike’s list of variables were controlled (mostly or completely) in my blog by using the same stream in three consecutive weeks over a total of 14-16 days. The value of any hypothesis is determined by repeatability and how general it is. If it is general, then the hypothesis moves to being a theorem (technical term for a pattern established by consistent data). Theorems are more valuable as they provide greater predictability. Water visibility is somewhere between a hypothesis and theorem. I shared some supporting information where it explained some fishing experiences. This was addressed in parts 4 and 5 of my blog on “water visibility.” I attempted to show examples from other rivers where this factor explained previous fishing experiences. These experiences cover numerous rivers at different times of the year and would cover all of Mike’s identified variables. Thus, I would suggest that “water visibility” is a significant factor which one can use to narrow down where you will fish on a given day. 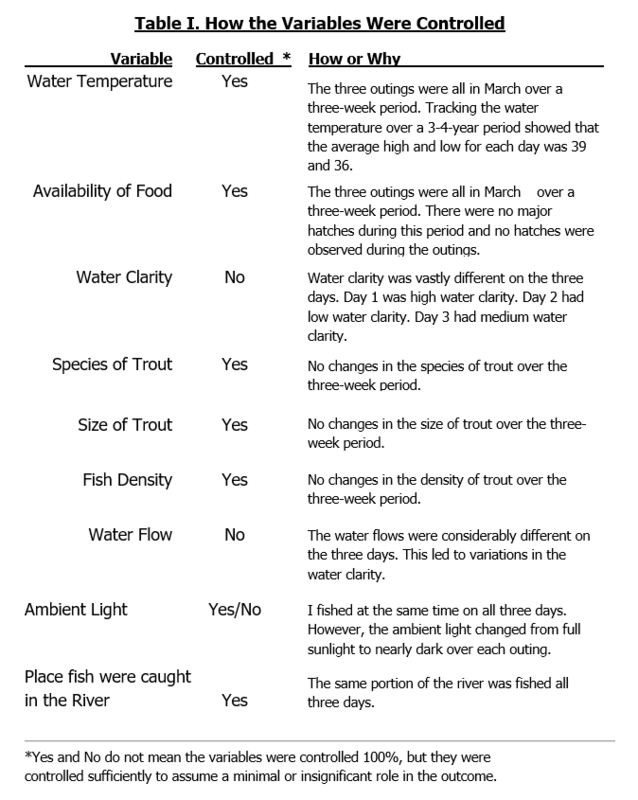 Table I below shows how all of Mike’s variables were controlled as a significant factor (meaning their influence on the outcome was at least minimal or possibly insignificant) for the difference in where the fish were caught on the three different days. This allows one to reasonably suggest that “water visibility” (the combination of water clarity and available light) was responsible for the differences in where the fish were caught. As you can see only the water flow and ambient light were not controlled during the three consecutive outings on the same portion of the same river. The water flow varied. It was low on the first outing, high on the second outing, and medium on the third outing. As discussed in the earlier blog, the water flow influences water clarity. The ambient light changed over each outing as I started fishing early afternoon and finished near sundown on each day. 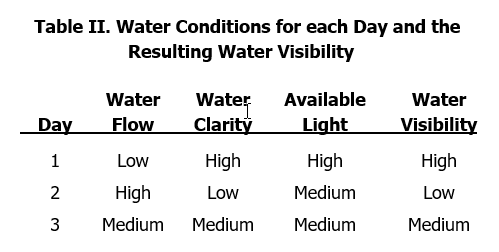 The table below summarizes the conditions and how that changed the water visibility for each day. The explanations for how the water visibility shifted where the fish were feeding is covered in Part 3. of the original blog. Please refer to that if you want to refresh your memory. With a potential pattern established. The goal is to test the pattern where other variables are introduced. If the pattern holds, it is increasingly general and useful. I have fished in many parts of the U.S., on numerous rivers, under all of the conditions Mike pointed out. There is no question that from time to time, one of those variables may outweigh water visibility as the dominant factor. However, every day you are on the water, most of the variables don’t change drastically over the course of the day and are not a major factor. Seasonal shifts are a different question. Over the course of months any one of the variables will shift from dominant to unimportant. One must factor that in to where and how you will fish on that particular outing. Challenge 1: Do your own test! Try thinking in terms of water visibility and see if it helps you catch more and bigger fish. Challenge 2: Read on below. I will present some other situations that are explained by water visibility. Challenge 3: Let me know at [email protected] what you think. I would be happy to hear your results. I am always eager to learn more from another fisherman. I know I don’t have all the answers (yet, I am hopeful someday to get there!). Night Fishing: I am naturally a morning person. Consequently, I have resisted night fishing as I pay for it all day the next day. However, I have started dabbling with it in recent years. First thing I did was share a guide with a friend to learn the ropes. That saved a lot of time getting up to speed on the learning curve. We fished in very different areas from where I have had success during daytime and low light (sun up and sun down) times. Fish were primarily at the heads and tails of pools and in shallower runs with lots of cover and current. One of the areas we fished rarely yields a fish during my “ normal” fishing hours. I landed a fat 15” brown and hooked and lost a large fish in a shallow rocky flat with good current (the stinker caught my dropper fly on a rock and got off the lead fly). I have waded through that flat numerous times as I fish it during normal hours and have never seen nor flushed a fish that big. At night, big fish move into shallow water to feed. No sissy sips on night time takes. They blast the fly. I have talked to several night fishing guys, they give a similar story. Swift changes in conditions: This is the first time I have experienced this, so it is not confirmed, but is consistent with water visibility changing where fish feed. Unintentionally I ended up fishing between two major thunderstorm systems. The first came through as I was walking to where I wanted to fish. After the first system passed, I started fishing. The water was crystal clear. While the clouds were still in the sky, you could see the bottom clearly in over four feet of water. These are high visibility conditions. It was relatively slow. I caught an occasional fish on the edges of deeper runs every 15-20 minutes. At first, I didn’t realize it, but the water became increasingly hazy as run-off worked its way down the river. Eventually, water clarity dropped to less than a foot. With clouds and low water clarity, water visibility was in the medium to low range. For about an hour it was lights out fishing. Every 2-3 casts resulted in a take. The fish were tight to shallow cover and blasting the flies. Then the water cleared and it was back to a fish every 15-20 minutes in deeper runs. Admittedly, I was fishing different water. But, the area I was fishing is a long stretch of knee to hip deep water peppered with boulders of various sizes throughout the whole stretch. While the water was not identical, it was very similar. Alternating Shaded and Light areas in a river: Some stretches of a river have alternating shaded and sunlit areas adjacent to one another. My experience is that I rarely catch fish in the sunlit areas and do catch fish in the shaded areas. This is consistent with alternating between high water visibility in the sunlit areas and medium water visibility in the shaded areas. Fortunately, this requires further study. I have decided to take a hit for the team and keep studying whether water visibility is general. Now I can tell my wife I have to fish more to corroborate my findings! Watch for further posts as I gather more data. Feel free to share your findings at my email provided earlier in the article. Finally, as I stated in the first series, there are numerous variables that influence where you catch fish. Water visibility may not work in all situations, but I have found that it helps me adapt more quickly as I sort through what is happening on the river. I am hopeful it will do the same for you. This entry was posted in Joe Dellaria, Learning From The River, Our Regular Contributors and tagged fly fishing, fly fishing tips, trout fishing, trout stream fly fishing on November 7, 2018 by Joe Dellaria. Joe, I can see your thought progression and approach. I have assumed for a long time that, as you postulate, water visibility plays a very important part of fish behavior; raw light too I think, but visibility is a critical closely-related nuance with logical impacts of its own. Recurring advice such as “flash can work to an angler’s advantage in cloudy water” and “dark flies (i.e. silhouettes) for dark days” have always tried to pay respect to the water visibility concept–same with old habits of shore-fishing late evening and early morning. Different highly skilled anglers may always conceptualize in different ways; I got a lot out of your series, just as I get a lot out of many articles here. Thanks again for writing it all up. Thanks for your comments. I can see that you are just like me, unselfish and willing to suffer through extra fishing to determine whether “water visibility” is an important factor influencing fishing success. Glad to have you in the club! Be sure to update me on your observations! Well I’m ever the faithful servant of Science, Joe. And I’ll make the ultimate sacrifice for my fellow human beings even if it means doing an awful lot of fishing. Yes, even that. Are we not heroes? You can count on me.